With over seven million copies of his books in print and seventeen titles on the New York Times bestseller list, David Weber is the science fiction publishing phenomenon of the new millennium. In the hugely-popular Honor Harrington series, the spirit of C.S. Forester's Horatio Hornblower and Patrick O'Brian's Master and Commander lives on--into the galactic future. Books in the Honor Harrington and Honoverse series have appeared on fourteen best seller lists, including those of The Wall Street Journal, The New York Times, and USA Today. While Weber is best known for his spirited, modern-minded space operas, he is also the creator of the Oath of Swords fantasy series and the Dahak saga, a science fiction and fantasy hybrid. Weber is has also engaged in a steady stream of bestselling collaborations including his Starfire Series with Steve White, which produced the New York Times bestseller The Shiva Option among others. Weber's collaboration with alternate history master Eric Flint led to the bestselling 1634: The Baltic War, and his planetary adventure novels with military science fiction ace and multiple national best-seller John Ringo includes the blockbusters March to the Stars and We Few. Finally, Weber's teaming with Linda Evans produced the bestselling Multiverse series. David Weber makes his home in South Carolina with his wife and children. 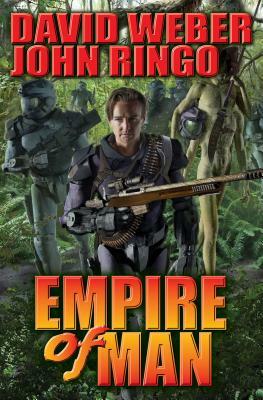 John Ringo brings fighting to life. He is the creator of the Posleen Wars series, which has become a New York Timesbest-selling series with over one million copies in print. The series contains A Hymn Before Battle, Gust Front, When the Devil Dances, Hell's Faire and Eye of the Storm. In addition, Ringo has penned the Council War series: There Will be Dragons, Emerald Sea, Against the Tide, and East of the Sun, West of the Moon. Adding another dimension to his skills, Ringo created nationally best-selling techno-thriller novels about Mike Harmon (Ghost, Kildar, Choosers of the Slain, Unto the Breach, A Deeper Blue, and, with Ryan Sear, Tiger by the Tail). His techno-thriller The Last Centurion was also a national bestseller. A more playful twist on the future is found in novels of the Looking-Glass series: Into the Looking Glass, Vorpal Blade, Manxome Foe and Claws That Catch, the last three in collaboration with Travis S. Taylor. His audience was further enhanced with four collaborations with fellow New York Times best-selling author David Weber: March Upcountry, March to the Sea, March to the Starsand We Few. There are an additional five collaborative spinoffs from the Posleen series: The Hero, written with Michael Z. Williamson, Watch on the Rhine, Yellow Eyes and The Tuloriad, all written with Tom Kratman, and the New York Times best seller Cally's War and its sequels Sister Time and Honor of the Clan, both with Julie Cochrane. In addition, Ringo's Princess of Wands and Queen of Wands broke new ground in contemporary fantasy adventure. And his science-based zombie apocalypse Black Tide Rising series includes Under a Graveyard Sky, and To Sail a Darkling Sea. A veteran of the 82nd Airborne, Ringo brings first-hand knowledge of military operations to his fiction.